A rainbow flag had been flying freely with pride on Gales Street NE. Until this past Sunday. “I came home from work and my neighbors tipped me off that it was burned and left on the sidewalk,” explained Shawna Dinger. The flag is covered with melted burn marks now. [The rainbow flag is] now screwed to a second-floor window. She also put up this message. Along with the quote: “Our lives begin to end the day we become silent about things that matter.” -Martin Luther King Jr. I have been a fan of Elvira’s since she first appeared on my midnight movie screen. I love the humor she brings to Halloween and hosting all those B-rate horror flicks. I was thrilled to find this ode to the Mistress of the Dark from the rock group Goultown. Telling our individual coming out stories never gets tiring because there is still someone out there who needs to hear it. They need to hear it to help education them about lesbian, gay, bisexual and transgender folks. They need to hear it because while we have come a long way, we still have a way to go. They need to hear it because somewhere in the world there is someone who still needs to know that they are not alone; that there is someone else who knows what they are going through; and that being gay and coming out is okay. In this youtube video, actor, Matt Dallas and musician, Blue Hamilton tell us their stories; a little bit more humorous than tearjearkering. 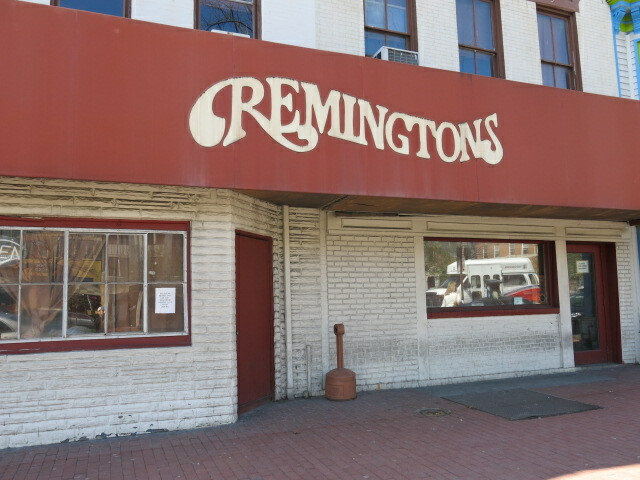 Two web sites that focus on local information and history for Washington, D.C. helped me solve a bit of mystery and brought me some more knowledge about one of my favorite old haunts, the former Remington’s of Washington, D.C.
Remington’s was a hugely popular country-western gay bar on Capital Hill in Washington, D.C. It hosted dance lessons, regular performances from DC’s all male dance group, The DC Cowboys and on weekends would be packed to the gills with folks socializing and twirling around the floor in line dances and partner dances. As D.C.’s nightlife moved more toward the center of the city and north to U Street area, Remington’s saw less and less patronage. Eventually, in the spring of 2014, the bar decided to close the saloon doors. Out magazine interviews filmmaker Dustin Lance Black and Olympian Tom Daley about their meeting and relationship for the magazine’s annual love issue. The most striking quote of the interview comes from Black, who comments on the different generational thinking between himself and Tom Daley, who is 20 years his junior. Black: I can’t imagine what it’s like today to discover who you are, and to start to fall in love, and your first thought is not, I could be imprisoned or be forced to undergo electro-shock therapy, but you start thinking about your wedding cake, and who you’re going to invite to the ceremony. It’s a huge change in LGBT culture, and it’s got to be lifesaving. The quote makes me smile because it shows just how far we come, internally and individually, as a community. msn.com gives us an update on some of the great ladies of country music and what they are up to now. Nash Country Weekly has a list of musicians, singers and songwriters who we have lost in 2015. Below is a sampling of some of the names. Lynn Anderson, July 30, 2015. – Lynn recorded one of country’s most iconic hits, “Rose Garden,” which also became a crossover smash. Lynn won the 1971 Country Music Association award for Female Vocalist of the Year and scored five No. 1 hits, including “Rose Garden,” during her career. Read more about Lynn Anderson.